Ann expressed an interest in visiting Chuang Yen Monastery in New York’s Putnam County during her visit. Since this is one of our favorite places to both visit and dine, we jumped at the excuse. Chuang Yen is a little known Buddhist monastery situated in some spectacular woodlands just down the road from the outstanding Fahnestock State Park. The monastery houses the largest indoor Buddha in the Western hemisphere, a 37-foot statue of the Buddha Vairocana surrounded by 10,000 significantly smaller statues on a lotus terrace. If this isn’t sufficient to pique your curiosity, visit during a weekend for the incredible vegetarian lunch. If there’s a more wholesome, delicious meatless meal to be found north of NYC and south of, say, Canada, I’d like to know about it. Chuang Yen is possessed of an unearthly tranquility. I am by no means attempting to invest the monastery with some divine beatitude. The serenity, however, is deliberate. Asian architecture conspires with wild gardens and sculpted terraces to create a natural landscape rich with surprises and wildlife. Birds do very well at Chuang Yen. A casual canvas of the grounds revealed, among other species, Chipping Sparrow, Yellow Warbler, American Goldfinch, House Finch, and an abundance of Brown-headed Cowbirds. Apparently, the lord of infinite compassion is accepting even of brood parasites. Though cowbirds certainly assert a brazen presence throughout the monastery’s grounds, the bird most evident in Chuang Yen this time of year is the Barn Swallow. Sleek aerialists bedecked in midnight blue and burnt orange swoop and dive amidst the inspired statuary along the Bodhi Path. While Tree and Cliff Swallows appear in lesser numbers, they seem to lack the Barn’s elan. The sportive industry of these fleet forktails made perfect sense when I observed a number of occupied nests pasted into the upper boards of the two crimson bell towers in front of the Great Buddha Hall. 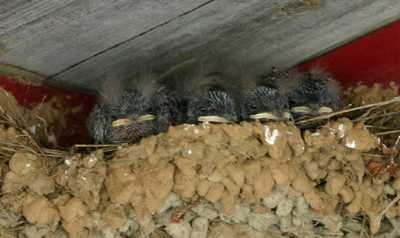 The only thing cuter than the appearance of the swallow chicks’ tufted heads is the improbable elasticity of their yellow gapes, particularly when a parent is presenting a juicy morsel. This sounds like a cool place to visit. Also, can someone please teach the black bears to eat house sparrows and feral cats? I live a few miles from Chaung Yen. I’m a gardener and while my landscape is not wild we have tons of different birds in the garden which we love. I have had smaller birds do this to obviously protect there nest and eggs which we try to stay away from until chicks are gone, but this feels like something else. I have to maintain my garden and really love the birds, but don’t like being attacked. Michael, unless you’ve got suet in your pocket, I think your attacker is motivated by the same protective urges as the smaller birds you’ve encountered. Based on your description of size, I’d guess you’re dealing with a parental grackle, blackbird, or mockingbird. Be patient – eventually every chick leaves the nest!